Our Abpromise guarantee covers the use of ab35088 in the following tested applications. BMP9 is a member of the bone morphogenetic protein (BMP) family and the TGF-beta superfamily. They are regulators of cell growth and differentiation. BMP9 has a role in the maturation of BFCN (basal forebrain cholinergic neurons) also inducing and maintaining the ability of these cells to respond to acetylcholine; BFCN are important for the processes of learning, memory and attention. BMP9 is a potent inducer of hepcidin (a cationic peptide that has a antimicrobial properties) in hepatocytes and can regulate iron metabolism. The physiological receptor of BMP9 is thought to be activin receptor-like kinase 1, ALK1 (also called ACVRL1), an endothelial-specific type I receptor of the TGF-beta receptor family. BMP9 is one of the most potent BMPs to induce orthotopic bone formation in vivo. BMP3, a blocker of most BMPs seems not to affect BMP9. 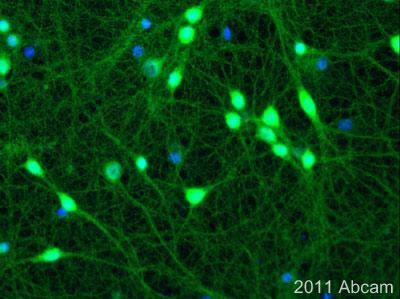 Immunofluorescent staining of BMP9 in rat primary hippocampus neurons with ab35088 (1/500). Cells were fixed with PFA and permeabilized with 0.3% Triton X in 0.1% PBS followed by a blocking step with 10% serum for 1 hour at 24oC. Incubation with ab35088 (1/500) was then performed during 2 hours at 24oC. The secondary antibody was an anti rabbit-Alexa Fluro 488. DAPI shows nuclear localization. Publishing research using ab35088? Please let us know so that we can cite the reference in this datasheet.